Last month, a series of tests indicated for the first time that Nate’s IQ is fairly below-average. Before then, his rowdy behavior and lack of interest had prevented him from participating in annual testing. But after many years of trying, school personnel have finally gotten a score they believe accurately represents his intelligence and skill levels. The report was very long and very dry, but to sum up the tester’s conclusion in his own words, “Nate’s scores indicate he will always be DE-pendant, never IN-dependant.” Ouch. For over eleven years, I have raised Nate with the attitude and deeply rooted belief that there are few limits to how far he can go, what he can learn, and who he can be. While it has been a long time since I believed that he will catch-up or become a typically developing, independently-living adult, I still see so much rich possibility in his present and future. I’ve always talked to Nate as though he understands what I’m telling him, and I have seen true comprehension in his eyes. I sometimes see him do things that blow me away with his level of understanding and astuteness. I approach raising him with the stubborn belief that he’s capable, and my decisions about him presume his competence. These test results almost threw me off the path that I’ve worked so hard to forge over the years, leaving me wading through a thicket of thorns as I attempted to understand what this all meant. I came to think of them as The Results. As they took on a life of their own, they had me questioning all the conversations Nate and I have had, the stories we’ve read together that I thought he enjoyed, the games we’ve played that I was sure he was learning from, and even the inside jokes we share that make us laugh. 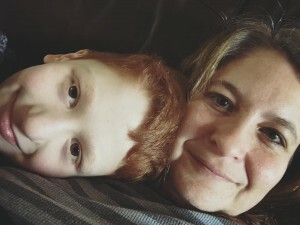 They had me wondering if the IEP goals we’ve set and dreams I’ve held were overly ambitious, and whether we needed to reassess most of the choices we’ve made for him. They had me struggling to decide how much intelligence really matters to me as a parent (it’s complicated), and thinking deeply about what a person who lacks significant measurable intelligence can contribute to the community and world around them (so much). The Results had me looking at Nate differently and considering a different future for him. They had me wondering if I’ve been over-estimating him all this time. They had me second-guessing my intuition about what my kid can do and understand. They had me mentally debating if these tests can begin to approach measuring my son’s unique strengths, and if they serve any purpose at all besides as a tool to qualify for services. And then a few weeks went by. At some point, the tester’s words stopped playing on an endless loop in my head and The Results ceased to matter so much. I stopped the always wondering if Nate understands what he’s seeing and hearing around him. I stopped trying to decide how theoretically important intelligence is to me. I remembered that I know Nate so well, better than almost anyone, and I don’t need a test to tell me who he is. I remembered every shared laugh, I remembered that he just learned to read the word Batman. I remembered that he can find a lost item faster than his 14 year old brother can, and that he knows all the elements needed to make a seed grow. I emerged from the tangle of weeds and found myself back on my path, back to the business of raising Nate and loving him for exactly who he is. The path is a little curvier and slightly more refined, but the direction hasn’t changed. Nate’s future is bright, promising, and only restricted by the lack of faith, creativity and support of the people around him. I will use those test scores to get him more of what he needs, but I will never use them to define him.